Dr. Robert Hamilton, a member of the Lighthouse Church in Santa Monica (my church), went viral in December with a video of a simple hold to calm crying babies. It seems not many people knew about this hold before, and it racked up 18 million views. He was interviewed on Good Morning America and by a host of over media. He became famous. But that’s not why I admire him. I admire him because he does medical missions for free. He’s even done two in my church in Guatemala (which I am no longer pastoring). Here he does the hold in Tanzania, where they just gave meds to hundreds of people in Mwanza. It’s a cute video. Supposedly, doctors halt viruses, but local pediatrician Robert Hamilton just went viral. His charming video on how to get a 1-month-old to stop crying hit 14.5 million views in little more than a week. It got picked up by Inside Edition, Mashable and True Feed. From there, the Huffington Post featured it. It moved to Buzzfeed and USA Today and was topping Reddit. Now, Dr. Bob — as locals affectionately call him — will talk on the Dr. Oz Show. Dr. Bob, originally from Eureka, has struck gold. Widely known and loved in Santa Monica, Dr. Bob has attended for 30 years to children of celebrities and soccer stars. He’s administered injections, checked newborns and calmed jittery parents. Dr. Bob has also led medical missions for over 20 years to Africa, Kyrgyzstan and Central America. Lighthouse Medical Missions have brought doctors and free medicine to some of the remotest parts of the planet on about 25 separate occasions through the decades. Early on, Dr. Bob was especially impacted by what he saw in Sierra Leone, once the world’s second poorest country according to United Nations rankings. In post civil war time, there was appalling need unmatched by the nation’s scarcity of doctors and medical infrastructure. He broke down in tears. Did the child live? He felt compelled to return to Africa. Dr. Robert Hamilton in Africa on medical mission for Lighthouse Medical Missions. To help where need is great bestows its own rewards. It has added to an already enriched life. He is happily married to Leslie Hamilton. They both have six kids and six grandchildren. His daughter Noel also studied to be a pediatrician and now works alongside her dad in his business on Santa Monica Blvd across from St. John’s Health Center. Lighthouse Medical Missions (LMM) has raised hundreds of thousands of dollars for its medical missions. They take all their own medicine and equipment. They have built four schools/ churches in Sierra Leone – in Lungi, in Lunsar, in Jui, and in Kenema. Two full-scale water projects have been funded. Dr. Bob, a born-again Christian since age 13, attends the vibrant and historic Lighthouse Church, from which he borrowed the name for his medical mission. LMM is open to just about anyone going and donating, even if they don’t share the Christian values of Dr. Bob. Dr. Bob studied his undergraduate at U.C. Davis, where at age 20 he also married his childhood sweetheart. Then it was off to UCLA Medical School. His latest venture – into the online world – started as a rather unambitious attempt to help parents calm fussy babies. He recruited talented film-makers from the Lighthouse Church and posted it on Sunday. Several church members shared it on their social media. Dr. Bob – whose wildest dream was for 10,000 views – was disappointed with only 80 the day after posting. But somebody of influence spotted it and re-posted it. It exploded like a nuclear bomb: by Tuesday it had 570,000 views. The next morning, 1.5 million. At last check last night, it hit 8.7 million. “This is just phenomenal,” said a surprised Dr. Bob. Meanwhile in his clinic, he’s prescribing to stop viruses. *Picture: Rarely does Dr. Bob skateboard outside his office. Note: Since I wrote this article for the Santa Monica Patch, I am including it here on my blog. I hope you enjoy. Dr. Bob with the reason we all work so hard. Dr. Bob Hamilton started medical missions in 1998. To fund these expensive ventures, he went from upscale to large-scale. When the high-end dinners didn’t work, he launched a walkathon around Santa Monica. 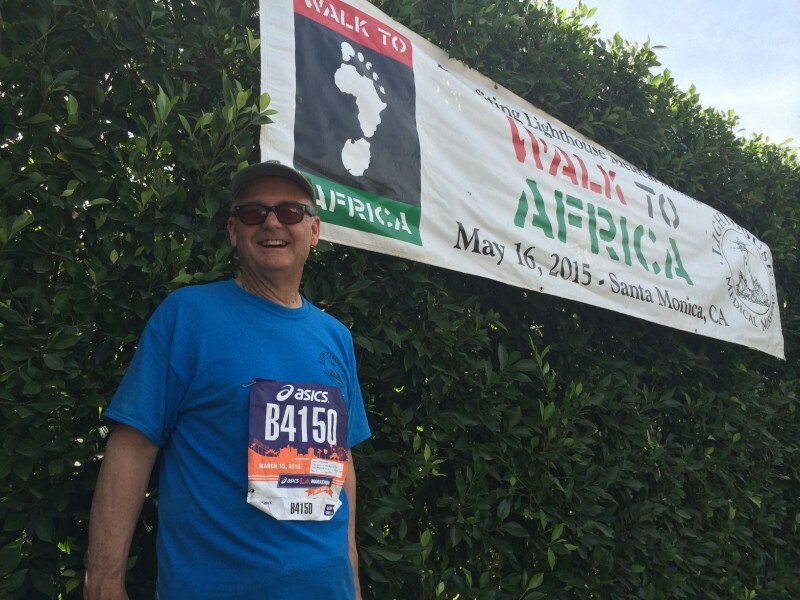 We just completed the seventh annual Walk to Africa. I and my family were a few of the 100 volunteers. My job was a cheer people on at the 6-mile mark, offer food, point out the bathroom, point out the right direction after they rested. I can take satisfaction in doing my all — just a small but integral part — in raising $115,590, over half the goal. My cousin called me the Energizer Bunny. I just want to see big things done for God. I don’t want to die not having spent my energies for Jesus. As I return from a far-too-short trip to Mwanza, Tanzania, I find my thoughts continually returning to the wonderful people we met and treated in our medical clinic. Last spring I first joined Lighthouse Medical Missions as a volunteer on the Guinea-Bissau Team. I was in nursing school at the time and met Christa Czer there who introduced me to Dr. Hamilton. That first trip taught me a lot about myself, and rekindled my love for helping people who are in dire need. While it was a great experience to work as a scribe and pharmacy crew member, it was nothing like the thrill of being an actual medical team member this year. As a nurse I felt more personally responsible for the patients I cared for, and left with the feeling that I was able to make a sincere difference in people’s lives. With the team on our half-day off. Working with two other brand new nurses and friends, Christa and Claudio, was both terrifying and exhilarating at the same time. We took nothing for granted, worked together on unfamiliar maladies, and made it a point to try to educate our patients in ways to prevent further illness. One of our most serious cases was a woman that had undergone a surgery over a year ago in her auxiliary area (armpit). The wound became infected, never healed, and had begun tunneling further into her tissue. We were able to see this woman all five days of our clinic to clean and dress the wound and administer antibiotics. Christa was even able to work with one of our interpreters to find a nearby clinic where she could continue to get treatment at no cost. When the doctor peered into the patients right, “deaf” ear, he saw larvae, living and dead. With a few scrapes with Q-tip, he extracted the critters, and the deaf man could hear again! This is what happens in the rest of world, where medical access is limited either by availability or cost. This is what happens when Lighthouse Medical Missions comes to town. Their recent clinic in Mwanza, Tanzania, attended to 1,200 — HIV patients, malaria sufferers and insect-invaded ears. Felipe, in the middle, with fellow volunteers. “It’s crazy stuff,” said Felipe Rodriguez, who pitched in on the trip. Not only are the locals dramatically impacted, the American volunteers are too. Fun-loving Felipe hit it off the kids. “Every where you go, the kids grab your hands and want to go with you,” he said. Now that they have seen conditions in Tanzania, they no longer live in a bubble. When the group visited wildlife on a nearby island on Lake Victoria, Felipe joined some students on a field trip to take selfies with them. They acted like rock star fans. “Your smile will heal all their sicknesses and wounds,” Felipe said. Tears streamed as Salome recounted how the C-section didn’t save the baby. Katelyn Myer became painfully aware of the gaggle of kids screaming and laughing and tumbling around the clinic as she listened to the Tanzania women share her sorrows. An actress in Hollywood, Myer only recently became a Christian. She joined the Santa Monica-based charity LMM this month to give of herself. “It was a really intense and beautiful and incredible experience,” she said. In all, LMM attended to 1,800 patients for five days and held evening church services. “It really pushed home that the theme of the Bible is love,” Myer said. Medically, the doctors couldn’t do much to help Salome. Her pain was in her heart from the stillborn child. So Myer gave her emotional support. As they left the clinic Friday to tour a bit, the patients were cheering and singing songs of praise. Then she remembered a prophetic word her boyfriend had received before coming to Africa. Someone had told him, “You need to say the word ‘Life’ to somebody over there.” It was time to say the word. We don’t know yet if Salome is pregnant again. Arti made friends with his guitar. Yes, he called himself “a Satanist” when he was a punk kid rebellious towards his parents’ Christianity. Yes, he beat up kids and got kicked out of schools. Yes, he played hard rock with — um — not the best lyrics. But when he faced a truly demon-possessed person, it was different. Arti, who turned his life over the Lord years ago and was now serving in Tanzania on the Lighthouse Medical Missions, freaked out when the lady he prayed for started behaving erratically. The crowd waiting a turn to see a doctor. After the first day of assisting doctors at the clinic in Mwanza, Arti requested permission to set up a prayer station and pray for all the patients after doctor visits. “I really wanted to be like Jesus and lay hands on the sick and see them recover,” he said. That done, he was engaged in praying for a lady with back and leg pain. When he asked her to forgive all who had harmed her, she grew eerily silent. Then she started getting aggressive. Arti knew what he had to do (expel the demon in Jesus’ name), but he got scared. “I’ve never performed an exorcism before,” he said. When it was done, he led her to get her pills. But he watched his back, lest she become aggressive again. His buddy, Johnny Huerta, didn’t seem to have the same fears. He went over to her and gave her a hug. “I was more afraid she would jump on me, and he was more concerned to let her know that she was loved,” Arti reflected. Santa Monica pediatrician, Dr. Bob Hamilton, who founded and leads Lighthouse Medical Missions, in Tanzania in Spring 2015. Arti turned his life over to the Lord in the Lighthouse Christian Academy in Santa Monica, which is part of the same church that indirectly oversees Lighthouse Medical Missions. The lady showed up at church that night. She raised her hand at the altar call to receive Jesus. She testified that the pain in her back and legs was gone. Arti saw the supernatural on the “natural mission” of dispensing medicine. He also saw how to become more like Jesus and minister compassion. Dr. Bob pauses from the L.A. Marathon at mile 23 to take a picture in front of his banner. It is rare to get him to take a pause. If the U.S. needs an alternative source of energy, it might try connecting a power line to Dr. Bob Hamilton’s house. They could tap into his brain – or his heart – and siphon off his excess personal energy during the night to supplement the local power grid. On Saturday night, Hamilton, a board member for Santa Monica Symphony, was relishing Vijay Gupta’s masterful violin interpretation of Beethoven’s toughest concerto in the Wilshire Boulevard Temple in Korea Town. On Sunday morning, he was running the L.A. Marathon to raise funds for another pet project, African medical missions. I was stationed at mile 23 to snap his picture and interview him. He wasn’t talking about pain. He wasn’t groaning about crawling to the bitter end. He was jogging at a good pace, and he was planning his work immediately after the race. “I’m going to Africa in a week and a half, and I’m thinking that I have a lot to do before I go,” he said as I jogged alongside him. What, no rest – even after a marathon? At all times, Dr. Bob is a tornado of activity. And thanks to a mythical work rate, he’s established Pacific Ocean Pediatrics in Santa Monica, served on half a dozen community boards and headed 22 medical missions to Africa and elsewhere. Read the rest of the story.